You may have seen worrying news reports last Friday about the Svalbard Global Seed Vault. Thanks to slowing increasing global temperatures, melted permafrost around the vault flooded into the 50-foot entrance hall, freezing in place. Thankfully, none of the seeds were affected. Now, the group behind its construction is repairing the damage and implementing some improvements to the design. 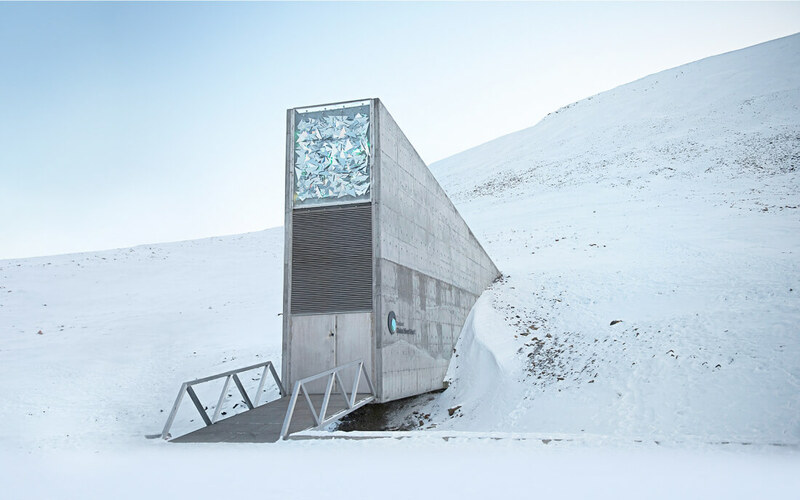 The vault, which holds almost 900,000 seed samples, is designed to protect its contents from global disasters such as nuclear war, thereby ensuring a food supply for whatever is left of the human race. The vault is sunk into the side of a mountain on the Norwegian island of Spitsbergen in the Svalbard archipelago, around 620 miles away from the North Pole. The deep permafrost was expected to provide a “failsafe” protection against natural or man-made doomsday scenarios. Ironically, it’s this permafrost that led to the vault being breached. At the end of the hottest year on record, increasing arctic temperatures resulted in melting ice and heavy rain. “It was not in our plans to think that the permafrost would not be there and that it would experience extreme weather like that,” Hege Njaa Aschim, a spokeswoman for Norwegian state construction group Statsbygg, told The Guardian. "A lot of water went into the start of the tunnel and then it froze to ice, so it was like a glacier when you went in,” she added. Statsbygg stresses that the seeds have “never been threatened,” but it is still making some “technical improvements” to the vault. It is building waterproof walls inside the tunnel and ditches outside to channel away the water, and electric equipment (such as the transformer station) is being moved out of the entrance to avoid creating heat sources. Additionally, the number of visitors is being reduced to limit human body heat. Temperatures in the arctic are rising at twice the global average; something scientists blame on the greenhouse effect. So while we don't have to worry about the seeds, we should probably be concerned about an increasingly hotter earth.